last night was our company's first (of three) christmas parties, held at koko in camden. and in the pub across the road from koko because there are too many of us, and they needed a second venue for overflow. lol. 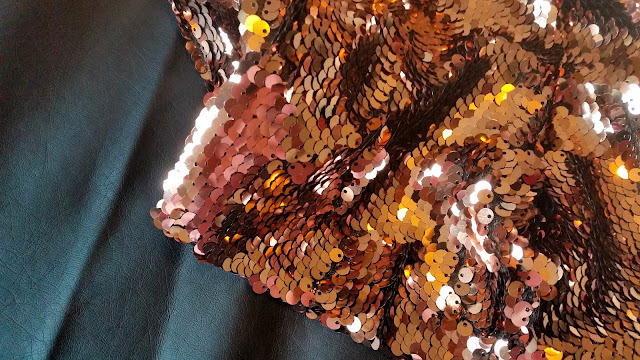 the theme for the night was 'guilty pleasures' and short of going dressed as justin bieber, i decided to throw caution to my better judgement and just wear a bit of bloody sparkles instead. yes it's christmas, yes. but as discussed recently there is just no way you are going to catch me in any red or green or gold, so i did a very a very erica thing and wore my own special version of christmas colours. 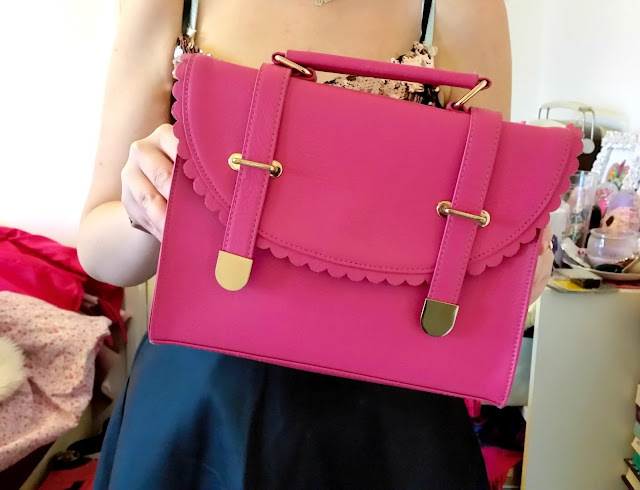 i subbed red for hot pink (natch) and the green for turquoise (hard to tell, thanks to new phone totally focussing on the background not the foreground), and instead of boring old gold, went for the metallic du jour (although i think we all know it's been a fave of mine for years) - rose gold. i am incredibly sorry about the awful picture quality here, again; a terrible combination of new phone not yet totally worked out, and some ridiculously low light has made for some pretty shoddy images. i try to wait for the brightest part of the day to get these snapped, but.. oh well. use your imagination, yeah? and before you wonder, yes - i wore a black bra. it was washing day, ok. jeez. 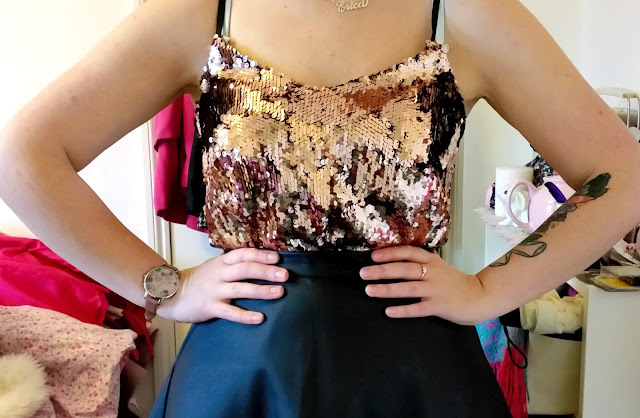 i love the combo of rosey sparkles against the leather look skirt, i think it gives it a bit of a "i mean business, but i'm also going to drink cocktails all night" vibe. which - let's be honest, is a vibe i can definitely pull off. unlike bare legs after an already-long winter. who knows if these shoes were a good choice. let's just say i totally packed tights and boots too. 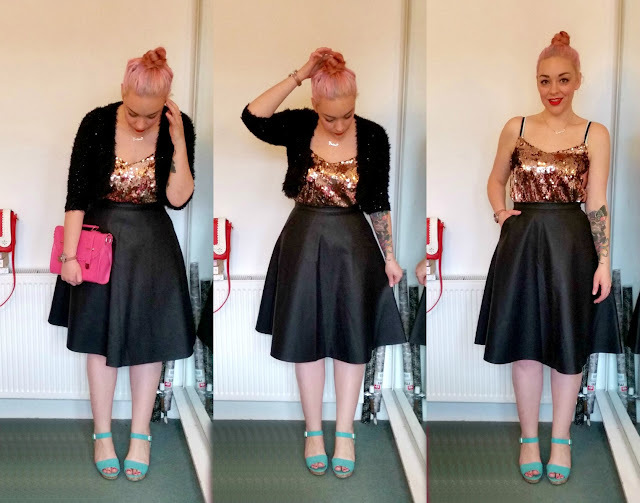 i think sparkles are a safe bet at christmas, but i love this outfit so i am already planning many other ways to wear it in a less christmassy way! suggestions welcome below.